Season’s Greetings from the NCTRC Board, Committees, and Staff! The NCTRC Board of Directors recently conducted its fall meeting on October 4-6, 2017 at Georgia Southern University in Statesboro, GA. The NCTRC Board meets in person twice a year (Spring and Fall) to conduct its business and to review current issues and strategic initiatives. The Board had a very productive meeting that included discussions related to new marketing initiatives, data management system transition, and overall status of the credentialing program, among many other topics. Please be sure to review all communications from NCTRC regarding impending changes to certification standards and online access to certification/recertification processes as the transition to the new data management system has been completed. As always, visit www.nctrc.org or call the NCTRC office (845-639-1439) if you have questions. Melissa L. Zahl, PhD, CTRS/L was elected to the position of Chair-Elect of the NCTRC Board of Directors at the Board’s fall meeting. Melissa, who has served in the capacity of Vice Chair and a member of the Executive Committee during the past year, will assume the position of Chair of the NCTRC Board of Directors in April 2018. Melissa has a Bachelor of Science in Recreation Leisure Services with an emphasis in Therapeutic Recreation from the University of North Dakota, a Master of Science in Parks, Recreation, and Tourism and a PhD in Parks, Recreation, and Tourism from the University of Utah. Melissa is currently Associate Professor at Oklahoma State University. She teaches undergraduate and graduate students in recreational therapy as well as recreation management and leisure studies. She advises and mentors graduate students. Her scholarly activities focus on recreational therapy and physical medicine and rehabilitation. The fall meeting of the NCTRC Board is viewed as an opportunity to connect with students and CTRSs at local events and regional conferences. This year, the Board was able to attend and present at the Georgia Therapeutic Recreation Association (GTRA) Inaugural conference. The one-day conference included a variety of topics presented by members of the NCTRC staff and Board of Directors, as well as Board members of GTRA. If your state association or academic program would like to host a NCTRC Board meeting, please contact Anne Richard, at (845) 639-1439 or arichard@nctrc.org to discuss the possibilities. NCTRC would like to remind you that if your five year recertification cycle expires at the end of 2017, you will need to submit your recertification application via MY NCTRC LOGIN before December 31, 2017. NCTRC can not accept recertification applications after this date. Annual maintenance applications are also due no later than December 31, 2017. If you are required to be certified for your employment, NCTRC recommends submitting your application early. To submit your application, log in to MY NCTRC LOGIN. To respond to certificants’ requests for immediate access to an updated certificate, NCTRC adopted a new business process that allows certificants to print their own certificate directly from the MY NCTRC LOGIN portal. Please go to the Dashboard Profile and print your updated certificate by selecting CTRS Certificate. The NCTRC office will mail certificates upon initial certification, recertification every 5 years, and upon request. NCTRC Board of Directors sent two representatives to the American Congress of Rehabilitative Medicine conference held October 25-27, in Atlanta, Georgia. The plenary opening session by Dr. Gary Ulicny, reported that recreational therapy provides value and had good outcomes, and in his last slide he encouraged the audience to hire recreational therapists. This set the stage for a very warm welcome extended to NCTRC from conference attendees. In addition to the exhibit booth, NCTRC also participated in the Chat with an Expert event held in the Expo Hall. 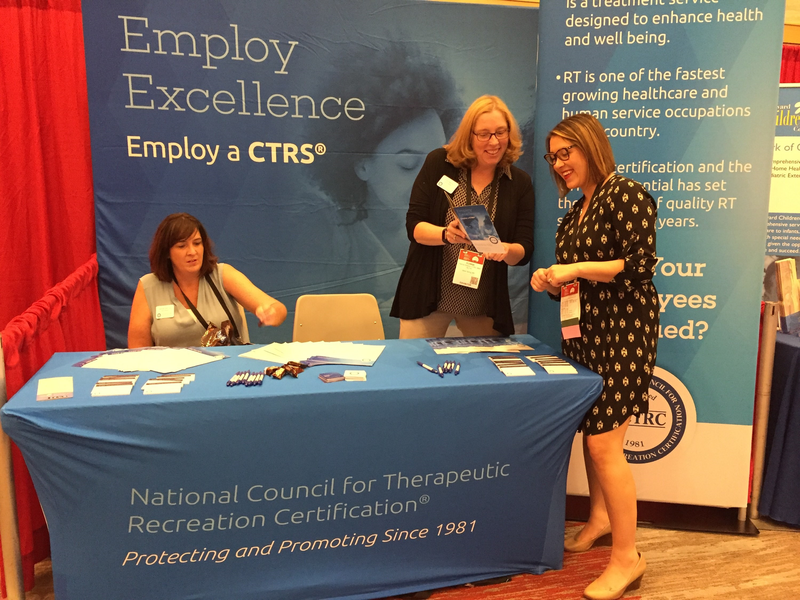 The two NCTRC Board Ambassadors spoke with 100+ event attendees about the value of the CTRS credential and recreational therapy within rehabilitation services, and had an opportunity to showcase some of the new marketing/tradeshow display pieces. Please contact NCTRC at 845-639-1439 or nctrc@nctrc.org if you have any comments or questions. Thank you for your continued support of NCTRC and the CTRS credential!